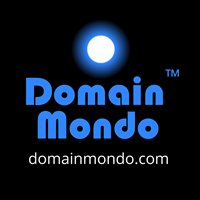 Domain Mondo's weekly internet domain news review (NR 2019-02-10 with analysis and opinion: Features • 1) EPDP (Draft) Final Report to ICANN GNSO Council Feb 11, 2) Other ICANN news: IDN Variants, gTLD Security Threats, TSG, Board Report, 3) Verisign $VRSN, Tucows $TCX, and more, 4) ICYMI, 5) Most Read. UPDATES Feb 14: GNSO Council Extraordinary meeting 21:00 UTC (4pm EST in US). Item 3: COUNCIL DISCUSSION – Final Report of the Expedited Policy Development Process on the ICANN Board Temporary Specification on gTLD Registration Data (50 minutes). Margie Milam (EPDP member, BC - Facebook) email Feb 14: "... Since there was consensus to publish the Initial Report, the Council should have simply notified the EPDP Team in November that it had no objection to proceeding to Phase 2. Indeed, this reference to the Initial Report confirms that there was no intent to wait until consensus for the Final Report. In our view, it is problematic to change the interpretation of the Charter midstream during the EPDP’s deliberations for those stakeholder groups and constituencies that relied on this interpretation of the Charter ... Per the charter, work on an access model should have begun late last year. Instead this work has been deferred to Phase 2 of the team’s work. What is unclear is when the EPDP team will take up its remaining responsibilities under the charter and produce an actual “final” report - – which must occur prior to the expiration of the Temp Spec on May 25, 2019. We hope this helps clarify our thoughts as the Council considers these procedural issues in its call later today. We’d like to encourage the Council to ask the EDPD Leadership to create a timeline for producing the Final Report -Part II that brings the work to a close in an expedited manner." Response to Milam's email above from Milton Mueller (EPDP member, NCSG - Georgia Tech). Response to Milam's email above from GNSO Chair Keith Drazek. Response to the above from GNSO Chair Keith Drazek via EPDP email Feb 12. ICANN staff email to EPDP: "... any statements that your group want to see accompany the Final Report need to be submitted by Friday at the latest. As a reminder, even if your group supports the recommendations and consensus designations, groups have the ability to submit statements that are to accompany the Final Report ..."
EPDP Consensus Call - Bundle #3 (pdf) embed below: "... Bundle 3 of the consensus designations. As some items are still in discussion or newly minted, I have held off assigning a designation to those. To make it clear, I have created two separate tables (3A and 3B). I have taken a conservative approach in holding back a final designation where we have not received feedback on final wording. However, I do think we have agreement on nearly all of these and look forward to closing them out by the end of this week. Please comment on Table 3A by the end of this week if you disagree or wish to discuss the level of consensus indicated. Please use Table 3B to consider your response so that we can request a rapid turnaround on that table when it is issued." --Kurt Pritz, EPDP Chair Feb 12, 2018 (EPDP Mail List). As indicated in an update in last week's News Review, the EPDP 'drop dead date' was extended to Feb 25. 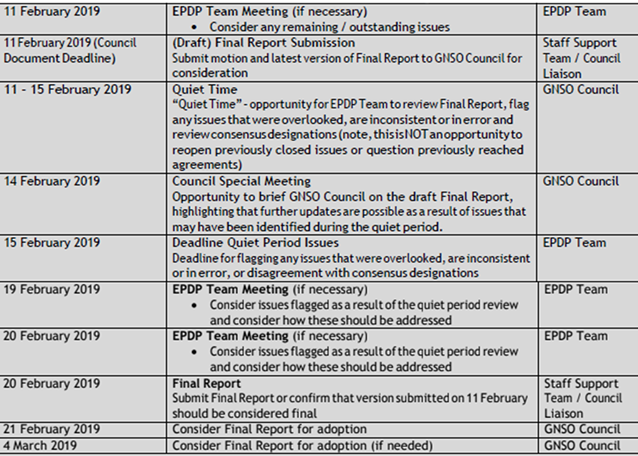 The EPDP working group is now scheduled to submit a "draft" (latest version) of its "Final Report" (Phase 1) to the GNSO Council on Monday, February 11, after one last EPDP plenary meeting that same day (details further below, including revised timeline). "... it was completely unrealistic to think that under the current pressure we would come up with something. Some of us said that from the get-go. Turns out we were right even if we worked in good faith. So we should consider anything we get in an interim policy as success. We've got a lot more mapping done. We've got a lot more of the issues out. This is a slow process, correcting 20 years of inattention. And I think one of the most important products that we can include in that interim policy is a list of things that we've already identified as needing revision to be compliant with GDPR." --Stephanie Perrin, EPDP member and NCSG Chair, Toronto EPDP F2F, Jan 18, 2019, transcript (pdf), p.58. Observers use Adobe Connect, or audiocast via browser / app. No other EPDP plenary meetings are currently scheduled for this coming week (see EPDP Revised Timeline below). Updates: Adobe recording and MP3. Links: EPDP Draft Final Report, the EPDP Initial Report (pdf) and public comments to the Initial Report; PCRT Public Comment Review Tool; GNSO Council EPDP page and updates; links to EPDP meeting transcripts and recordings are on the GNSO calendar. Other EPDP links: wiki; mail list; action items; Temp Spec; EPDP Charter (pdf); Data Elements Workbooks (pdf), packet (pdf) small team agreements, ICANN's legal memo on Controllership (pdf), Bird & Bird legal memos are here. EPDP legal mail list (latest Bird & Bird advice on data 'accuracy'). "... The Temp Spec contains this definition: "Registration Data" means data collected from a natural and legal person in connection with a domain name registration." The "in connection with" language is so broad and vague that it could be interpreted to data that registrars and registries would not consider to be registration data such as billing data, account creation data, and the like. RySG [gTLD Registries Stakeholder Group] proposes to revise the definition to reference the relevant data elements: "Registration Data" means the data elements identified in Annex [X], collected from a natural and legal person in connection with a domain name registration." (Annex [X] would then identify the relevant data elements, as carried over from the whatever becomes the final version of Recommendation 4) ... "--Kristina Rosette, Senior Corporate Counsel, IP - Domains, Amazon.com, Inc. (RySG). Feb 5: Kurt Pritz, EPDP Chair (appointed by GNSO Council): "... And question two will demonstrate how far out of my depth I am but you know ..."
Feb 5: Stephanie Perrin (NCSG): " ... any reference to contracts and Bylaws, needs a thorough review, as some policies/contracts/ and even the Bylaws could use an assessment under the GDPR ..."
Feb 5: Stephanie Perrin (NCSG): "As I have said over and over and over again.....we need to have a very clear understanding of who is the controller, and what data processing activities are under whose control. If we have that clear understanding, it has somehow escaped me." Feb 5: Stephanie Perrin (NCSG): "'Abandon all hope ye who enter here' ought to have been inscribed over the top of our charter ..."
Feb 6: Alan Woods (RySG - Donuts): "To channel Stephanie Perrin .... Thick WHOIS is dead ..... The Minimum data set is the new normal." For more on last week's meetings see last week's News Review. a. Recommendations for Managing Internationalized Domain Name [IDN] Variant Top-Level Domains Published--ICANN.org 05 Feb 2019.
b. ICANN Publishes the First Monthly Report on Generic Top-Level Domain SecurityThreats--ICANN.org 04 Feb 2019.
c. Technical Study Group [TSG] Makes Progress at First Face-to-Face Meeting | ICANN.org 04 Feb 2019: "... the ICANN organization [would] serve as the sole entity receiving authorized queries for non-public registration data, obtaining such data from generic top-level domain (gTLD) registries and registrars, and then passing that data to the third-party requestor. The TSG's aim is to develop a technical design and specification that could be used by implementors to determine whether a unified access model would be possible under the European Union's General Data Protection Regulation [GDPR] ... The group also agreed on several assumptions, detailed in our updated charter. We confirmed that the group's work will be built upon the Registration Data Access Protocol (RDAP) and will utilize the gTLD RDAP profile currently under discussion; that gaining access to non-public registration data would be centralized within the ICANN org ... We will explain all these in detail when we produce our final technical model ... We are all coming to the ICANN64 meeting in Kobe, where we plan to hold a community workshop to present our work and solicit your feedback ,,." See ICANN's Technical Study Group on Access to Non-Public Registration Data | ICANN.org. Office of the CEO: "The ICANN org Executive Team is working diligently and making progress on a variety of key projects, including the Information Transparency Initiative (ITI), Open Data Initiative, development of the FY21-25 Operating Plan, creation of a unified access model for non-public registration data that is compliance with the General Data Protection Regulation (GDPR) ... Since the October resignation of Akram Atallah, President of the Global Domains Division (GDD), I’ve been working with the Executive Team to determine how to handle his responsibilities going forward ... I continue to keep a close eye on the development of a proposed governance model for the Domain Name System (DNS) root server system." • Verisign $VRSN Q4 2018 Earnings: "In the fourth quarter, Verisign processed 9.5 million new domain name registrations for .com and .net, as compared to 9.0 million for the same quarter in 2017." More at the link above. • Tucows $TCX Q4 2018 Financial Results and Recorded Call: Wednesday, February 13, 2019 at 5:05 P.M. EST--tucows.com. "In lieu of a live question and answer period, for the next five days (until Monday, February 18), shareholders, analysts and prospective investors can submit questions to Tucows’ management at ir@tucows.com. Management will post responses to questions of general interest to the Company’s web site at http://www.tucows.com/investors/financials/ on Tuesday, February 26 at approximately 4:00 p.m. ET. All questions will receive a response, however, questions of a more specific nature may be responded to directly." News Release | KPI Summary 2018 (pdf) | Financial Statement (pdf). Editor's note: the KPI Summary indicates Tucows' "Domain Services" business is declining. Earnings Call transcript. • 04 Feb 2019 Letter from TUCOWS Reg Levy to ICANN Maguy Serad re: Tucows' Change of Registrant (COR) Process, excerpt: "... We respectfully submit that we have attempted to work with ICANN Contractual Compliance regarding our implementation of our contractual duties to no avail. We ask that you close this ticket, accepting that we are at an impasse and that there is no breach, merely a difference of opinion about how to best protect registrants and a divergence of opinion regarding contractual requirements that are vague." • GoDaddy & Spammers: thousands of dormant domains hijacked for spam simply by registering free accounts at GoDaddy and telling the company’s automated DNS service to allow sending of email with those domains from a spammer's internet address--krebsonsecurity.com. • Chrome browser lookalike detection feature battles URL imposters--nakedsecurity.sophos.com. • 01 Feb 2019 Letter from MARQUES Nick Wood to ICANN Cherine Chalaby (pdf) re ICANN's Review of the Uniform Domain Name Dispute Resolution Policy (UDRP), excerpt: "We believe that there should be no changes to the UDRP ...."
• Exec sacked after changing domain name from .org to .com without boss's permission--dailymail.co.uk: "We set up the website eight years earlier, and over that time we worked to make sure our website was at the top of search engines. If we changed the website domain it would be like starting at zero again ..."
That German-French Deal to "Rescue" the EU Copyright Directive? Everyone Hates It. EVERYONE--eff.org. Google censoring its search results in Russia--themoscowtimes.com. Tech lobby takes India to task over plans to police online content--reuters.com. Internet shutdowns violate human rights--mg.co.za. Blocking of VPNs in India and China spells trouble for our internet freedom--techradar.com. Why your online privacy matters, even if you have nothing to hide--techly.com.au.